This spicy potato masala recipe has been totally and completely flicked from my sister’s blog. I didn’t have curry leaves in the house and mine didn’t come quite as delicious-looking as hers, especially the gravy, but both TH and I licked the bowl clean. The simplicity of this spicy baby potatoes recipe makes me wonder why I’ve never tried this version before. If you love Indian baby potato recipes, then do check out my Banarasi dum aloo recipe, this aloo capsicum pulao, and my favourite Indian potato fry recipe that goes really well with curd rice. 1. Wash the potatoes. Pressure cook for 3 whistles (or put in a heavy-bottomed pan with sufficient water and let cook on a medium fire). Cool, peel and set aside. 2. 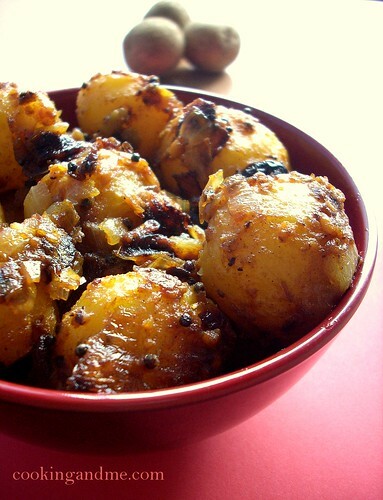 Add sambar powder, salt and turmeric to the potatoes with very little water and leave to marinate for half hour. 3. Heat oil and temper mustard seeds. Fry the urad dal next until golden brown and then add the onions and garlic. Fry well till the onions turn a dark brown (I like mine just short of burnt so that’s how I made it). 4. Add the curry leaves and the potatoes. Add about 4 tbsp water and toss well. 5. Cook open for about 25 mins until the potatoes look yummy and you can’t wait a single second longer to serve it already! Serve hot with rice and curry of choice. Goes weil with coconut based gravies, like kaalan. Hi!Great recipe…my kiddos jus love it!! I remember seeing this at Bharathy's and drooling over it. Tried and Loved the recipe. Hahaha! glad to know you can see the pics now! phew.. still using flickr. and where did you get the idea that am gorgeous?? hey I am alive and well – these look delicious! see though I am an eggplant lover I do veer towards the carbs first! 🙂 and I am so happy I can see your images here (UAE) as well – you changed flickr?? and you are drop dead gorgeous! Delicious potatoes! Look at those cuties! First time time to ur blog ..Thinking how i miss this wonderful blog . I like it exactly this way!!! missing ur sis, i guess. i don’t remember seeing this on her blog but now i gotto try it. Have a look here,I tried as I have told you before:) Tasted awesome!! they look spicy and browned well…. and glad you both liked it! I like urs than barathy’s;D (Hope she doesnt read this)i think i too have to try this,as i hav all ingredients in hand! It might be simple , itlooks super delicious, you guys licked the bowl, well we all can lick the screen as it looks so yumm. Here we never get curry leaves , i have never seen fresh curry leaves here, so when ever my hubby goes to london he buys heaps and heaps of curry leaves from theindian shop there. I freeze them in packets , so then i have curry leaves when ever i cook. Next time when you get a load of curry leaves freeze a bit. I remember seeing this at Bharathy’s and drooling over it.